The Uffizi in Florence 2019 - all information like tickets and prices. Here you will find information about the Uffizi Art Museum in Florence including admission prices, opening hours, online tickets and a list of the most important pictures. The Uffizi in Florence is one of the 10 most visited museums in the world. Those who come to the Museum Uffizi without a pre-booked ticket usually have to wait extremely long. 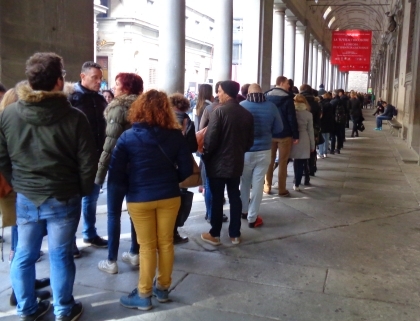 Already in the early morning, there is a long queue in front of the cash desk at the entrance of the top museum of Florence. It is not uncommon to wait several hours. Those who book in advance in the internet can enter the Uffizi Gallery much faster through another entrance. In the art collection you can find many outstanding Renaissance works such as those by Michelangelo, Leonardo da Vinci, Raphael, Botticelli or Titian. But there are also works by other famous painters and sculptors from other eras in one of the most important art exhibitions in the world. 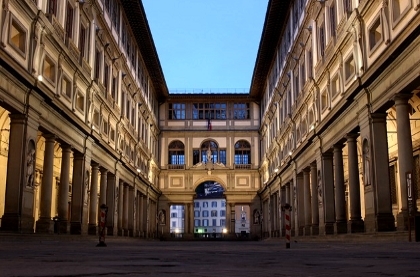 The large 19th century building initially housed authorities, hence the name Uffizi (Italian for offices). The museum is located right in the centre of Florence on the banks of the river Arno not far from the world-famous bridge Ponte Vecchio. The Italian name is „Galleria degli Uffizi“, internationally (English) the museum names „Uffizi“ or „Uffizi Gallery“ are common. The security precautions in the Uffizi Gallery are strict. After the entrance follows a scan of the bags and the body as at an airport. Afterwards, despite the scanner, all bags that are larger than normal handbags have to be handed over to a cloakroom. The first ticket check follows. Afterwards, you can enter the art museum in Florence either on the first floor or on the second floor. In both floors, there is a second ticket control. 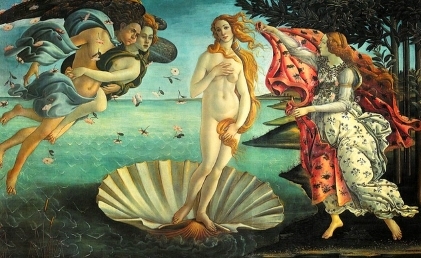 Now one is finally in the exhibition rooms of the Uffizi Gallery and you can devote yourself to art. We always start our tour on the 2nd floor and then visit the 1st floor. Thus, at least in the morning, it is possible to avoid the crowds a bit, as the majority of the museum visitors start the tour through the art museum on the 1st floor. The 2nd floor consists of two very long corridors which are connected at the end by a short corridor (u-shaped). In the two long corridors mainly sculptures are exhibited, the paintings are in the rooms next to the two long corridors. In the 2nd floor are the majority of the very well-known works of the Uffizi Gallery. For normal visitors of the art museum it is not easy to find the really world-famous highlights in the large mass of pictures in the Uffizi in Florence. A simple tip: If a large number of people admire a picture, it is usually very famous. In front of the top 10 paintings in the Uffizi there are always large crowds of people. You should also have a look at the sculptures and the ceiling of the corridors. At the back you can see the river Arno from the window. 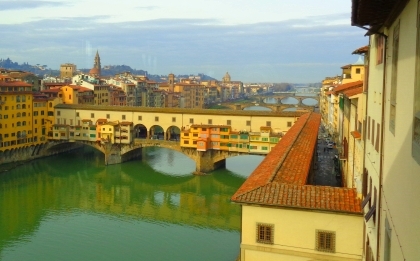 Famous is the view from a side window on floor 2 of the Uffizi to the bridge Ponte Vecchio. This window is also easy to find if you are looking for a big number of museum visitors at a window. In the first floors you find mainly works from other epochs (not Renaissance). However, some of Leonardo da Vinci’s works are housed in a special Da Vinci room on the 1st floor of the Art Museum in Florence. At the end of the tour, you will pass through several shops before you reach the exit. Here you can buy books on the subject, puzzle games, souvenirs, beautiful postcards and much more. There is also a bookstore on art, Renaissance and Florence (many books in English). After starting, you can rotate the video with the mouse (left, right, up and down). On the 2nd floor of the Uffizi Gallery there is a cafeteria with a beautiful roof terrace. A coffee costs only 1,20 Euro, if you drink it standing at the bar. At the table the same drink costs 3,60 Euro. This is often the case in Italy. Those who get hungry during the long visit to the museum can also buy a sandwich or something similar from approximately 5 euros. The Uffizi are open every day except Monday. The opening hours are from 8:15 to 18:50. In summer 2017 the Uffizi Gallery were open until 22 o’clock (June to September). It is to be expected that this will be the case again in the following summers. The entrance fees are not really high. A normal ticket costs only 8 Euro at the ticket office of the museum. The problem is the long queue. Even in January 2018 on a weekday we waited 2 hours. To spend a large part of a valuable holiday day in a queue is no fun. Therefore we recommend to buy tickets online before (see yellow box). Queues at the entrance. The waiting time is often several hours. The Uffizi Gallery is one of the top five art museums in the world. Even more famous in Europe are just the Prado in Spain and the Louvre in Paris. There is also the Accademia Gallery in Florence with the famous statue David.